We got these gorgeous turnip roots from the garden the other day and I wanted to cook them right away to take advantage of their freshness. Normally, I would simply cook these roots along with the greens or just boil them and simply buttered. This time around, I wanted to try something new because the ‘simply boiled’ recipes just was not such a big hit with the girls. I thought I would try pan frying them, much like you would potatoes. It was a hit! The girls loved them cooked this way and we almost finished the whole dish in one sitting! Melt the butter over medium heat. 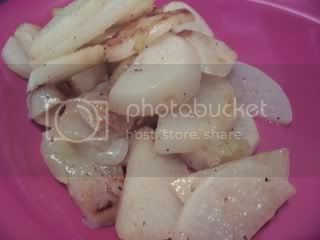 Place the turnips and onions and pan fry on one side for a few minutes until they start to get some color. Turn over and let it brown some more. Add 1/2 cup water, season with salt and pepper and cover. Let it cook until all the liquid has evaporated and it starts sizzling again. Adjust the seasoning and serve. Tried these tonight. husband brought home turnip roots from friend. i had never had before found your recipe online cooked them up. served with Hot cornbread along with other stuff was really good. Thank you for the tip. Family loved them. I’ll have to try that when the girls are in LA…sounds interesting. TGIF! 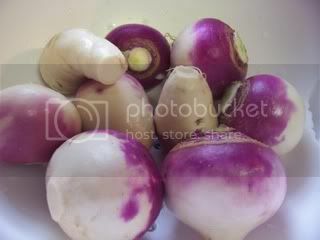 these sounds really good and i am not even sure if i like turnips!